Built in downtown Omaha in 1920 at the corner of 19th and Jackson Streets, Founders One • Nine is on the National Register of Historic Places. Its name is derived from the corner it resides on. History says that Jackson Street was named in honor of James A. Jackson. Jackson, one of Omaha’s original town site founders and founder of Omaha’s first department store, Tootle and Jackson. The mid-century modern building was formerly the Roy A. Ralph Printing and Lithograph Co. as well as Fisher Fixture Company and has been reimagined as Founders One • Nine, Omaha’s newest urban chic event space. Voted Number One in the Caterer Category for five years running as Best of Omaha. 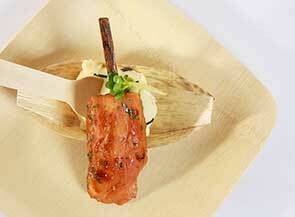 Our exclusive caterer, Catering Creations, features award-winning cuisine from executive chef Jeff Snow. 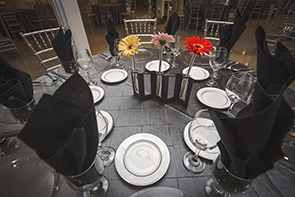 Catering Creations’ menus offer guests outstanding cuisine characteristic of a fine dining restaurant. Menus change regularly to ensure guests enjoy the freshest produce and ingredients. 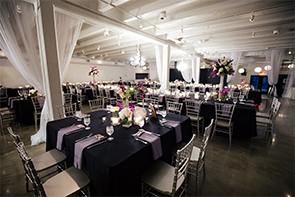 Our event planning staff is happy to work with you to create a custom menu for unforgettable special events and weddings in downtown Omaha. Learn more about Catering Creations here. Founders One • Nine only entrusts vendors that have the highest of standards when it comes to your event. Your event coordinator will provide a list of preferred vendors, all whom provide excellent quality and competitive pricing. These vendors are very familiar with the facility and provide our guests with superior service. You are more than welcome to use vendors that are not on our list with our approval. We will only withhold approval if we know of problems with a specific vendor. We are committed to our community. Each year, we donate 10% of our profits to local charities. We are supporters of several local organizations in our volunteer time, services, discounts, and donation dollars. These organizations include our primary projects: Food Bank for the Heartland, The Ronald McDonald House, Institute for the Culinary Arts at Metropolitan Community College, and Child Saving Institute. Check out our “For the Cause” page here to learn more about hosting a fundraiser event at Founders One • Nine.